Terrell (who grew up in Texas and Mississippi) and Carmel (from Hawaii), found inspiration for their designs from vintage souvenir pillows of the 30's and 40's. Plus, they have a combined love for travel and endless curiosity of the world around us. Each pillow is hand embroidered and can take a full week to create. 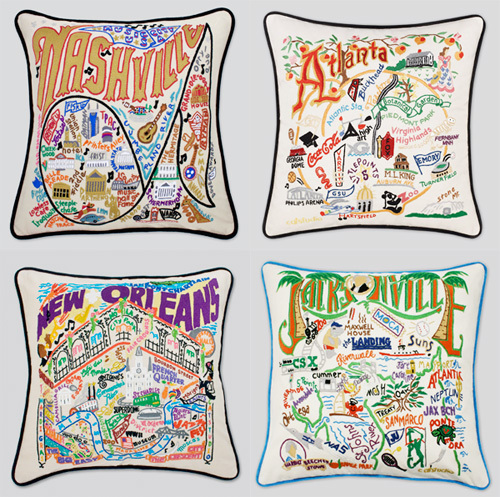 I really love each of these as they are amazing conversation starters to add to your couch, chair or bed and also serve as a reminder of the places you love, or hope to visit. See all of Cat Studio's cozy and fun creations, here.